My son asked for a quilt, but "not too flowery, not too sweet, please mum"
I got started with much enthusiasm and then quickly ran out of the main DS fabrics! Additional fabric arrived this week. More sorting, more slicing, more sewing.. almost done! Looking at the pics in the lovely sunlight, I see I do still need to iron it again! and then it's off to the quilters for a bit of 'modern squares' magic on those cream -ve spaces! I love seeing what everyone else has been up to! is a fat quarter really ever enough? I've been asked to make a quilt thats "not too flowery, not too sweet." In This Corner is one of Denyse Schmitd's quilt patterns. It uses her latest Hadley fabrics with coordinating solids & one cream fabric... and it looked perfect for this next project. Well you know me, I just wanted to get started, straight away!! This wasn't on my to-do-list at all, and I didn't have the pattern! So I created my own version of her quilt... I had a few DS fat quarters and plenty of assorted creams in my stash. I worked out the block size I needed, and started cutting. I cut 9" squares, paired them up, sewed 1/4" either side of the midline, and then cut them across the diagonal. Quite a few large HST triangles, this is looking good! and then suddenly I had more creams than Hadleys!! It seems I had not worked out if the fabric I had here would go the distance of a double bed sized quilt!! Over the past few years I have only bought fat quarters. I make alot of scrappy quilts and so a little bit really does go along way. And, I don't often use just one designer range, preferring to mix-n-match everything up! And, I also do have a bit of a fabric stash here, so "using- the- stash" has become my driving force over the past year! So when buying a little extra fabric, fat quarters it is for me! However, if you want to make quilts that are fresh & modern, some ideas do seem to need larger amounts, not only for the -ve quilting space but also for the larger scale design elements, yes? But all is not lost - I will order just a bit more, and will wait just a bit longer to finish this! ... how much do others buy when getting fabric? I picked up my Gypsy Wife quilt yesterday from Annette, at Wild Cotton Quilting in Laingholm. The quilting is kinda hard to see in the photos I know, however, I really wanted something quite subtle, something that wouldn't detract from all the piecing in the top... and it is just perfect! I chose a wandering vine & leaf pattern, Annette enlarged it so that it wasn't such dense quilting, and the end result is a soft & cuddly quilt! For the binding I used oval elements in eggplant - my favourite at the moment! I think it puts a definite "full stop" frame around all that potpourri of colour quite nicely. Little Olive had a "granny day" today! The first skirt was tried out & tested immediately as you can tell from the pics! Thanx for the comments on my last post. I decided to go with good old straight line machine quilting and have opted for a vintage-y pink binding. Hm-m-m-m finally finishing this little neglected quilt really got me thinking! If you are like me and juggle a few WiP's, then you already know that, at some point, you do actually need to finish a few things! 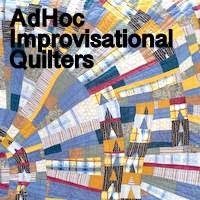 Babies get born, birthdays come around, there's Xmas prezzies to think of, and other people need quilts, for whatever reason! Not so long ago I had put together a list prioritising what I needed to do. So when I've had time over this past week or so, I have slowly started working my way thru' that list. I didn't get sidetracked, and I haven't got bored! I put together my Diagonal Madness top first, mainly because I wanted my design wall back! This top has ended up miles away from my first idea, but I like it! The pretty prints combined with a few basics makes for a soft vintage-y feel. I ended up using the very last of a true vintage piece I had, the blue floral stripe on cream. And now that it's all pieced together & pressed, it's that much closer to the finish line... but still a WiP! I finished hand stitching the binding on my pastel BOM quilt. This quilt is seriously huge, and once I'd machine sewn the binding onto it, I just left it! I think the size of it simply put me off! So this past week in the evenings I've biten-the-bullet & been busy stitching down the other side of the binding, and now it's finally on the bed... just in time for summer! And lastly, I machine quilted my triangles quilt, which I had left lingering for far too long! Overall most of the fabrics are darkish, so I threaded up my darkest grey, selected a longer stitch, and went for it! I quilted straight lines, using the triangles as my guide. This open quilting pattern has given the quilt a soft & cuddly finish! And I love all the colours! So I guess, this is still technically another WiP, as I'm now in the process of deciding about the binding! I'm tossing up between oval elements in eggplant or gold I've going with the oval elements in eggplant for the binding, as it really makes the golds in the quilt "pop". I must admit, it will be hard parting with this quilt, but there you go! but right now I've got another WiP I really want to get on with! What are you all making at present? The weekend*... well, the bookcase in my sewing room collapsed this weekend! Way too much stacked in it and on it I guess! Everything just tumbled down in a right old mess! So while Mr D. fixed it out in the garage, I sorted thru' all the stuff that had fallen off it! A book I rediscovered was "The Gentle Art of Quiltmaking" by Jane Brocket, very pretty, very floral. And I recalled making a couple of quilts some time ago inspired from a quilt in this book! The larger quilt I gifted to a doctor at work who was having a rough week, and the other? One of my quilty secrets is that I tend not to finish everything... you know, immediately! I juggle alot at any one time. And I like it like that, as I tend to get bored quite quickly! I found the other quilt top today in the depths of the wardrobe! I made this quilt using one large floral as my focus fabric, adding spots, solids and other blending green, blue & purple fabrics. I remember at the time I didn't have anywhere near enough fabric left to make another big quilt so I settled for a sort of lap size. This basic design is a real favourite of mine, four stripe blocks alternating in a horizontal & vertical pattern. Yep, it is quick & easy, but it also offers heaps of variety depending on your fabric choice... I've made the ice cream version from Jane's book, where the fabrics all melded together in a pretty peaches & cream effect, then a low volume version and a crayon box version with primary colours. All gifted now to new babies & their mums. Anyway, today I layered this quilt top all up, pinned it, and am now going to have another go at FMQ. Wish me luck! *Update... 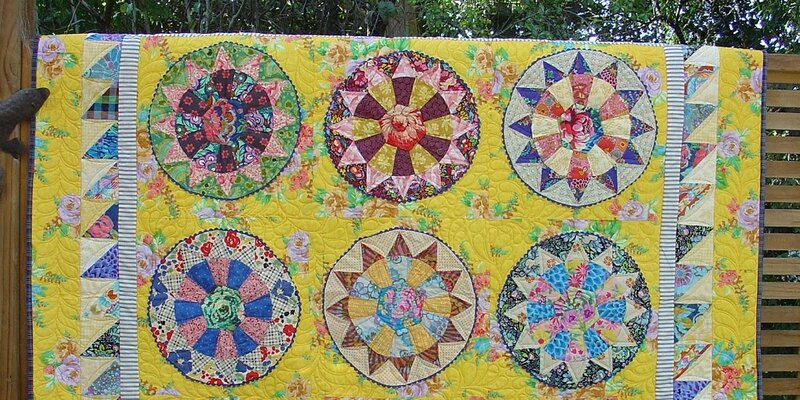 I've enjoyed just looking at this quilt, the colours remind me that spring is coming and that my heavily budded wisteria will burst out in flower very soon! But as for the FMquilting? Well, today I've been unpicking - let's just say I can see why many opt for a bit of hand quilting! At least you can put a little hand-loved quality into a simple quilt, and control the curvy quilting pattern a bit easier! Linking up with Lee for WiP Wednesday @ Freshly Pieced. This BOM is aimed at giving a fresh look to some of the traditional blocks. The tutorials come out the 1st of each month on the dot and are super easy to follow, however there are also lots of suggestions to help make each block more uniquely your own. And I'm experimenting more & more each month, trying to look at the old blocks with fresh eyes! Take the Dresden Plate block for example - normally I wouldn't cut any of the wedges from the background colour but I kinda like it this way, it makes the other wedges look like they are floating and creates more of a low volume effect! And including a bit of improv piecing in the Churn Dash & Maple Leaf blocks sure seems to make for an interesting feature! Of course I have also fallen back on some old tried & true ideas, like just mixing a small amount of white in with the cream backgrounds to give a bit of spark, and like just using only a little of my accent purple "pop" of colour! Looking forward now to next months block! No sewing at all lately... I've been down in windy Wellington. And this past weekend was really lovely! Beautiful sunny crisp days, while Auckland was so cold, so wet & so grey! We had a very busy agenda... cafes, "High Tea", and lots of walking & talking & catching up. BUT my son did include a trip just for me, out to a patchwork shop! The fabrics at "Stitchbird" in Kilbirnie seemed a little bit different from what is available here in Auckland, and of course I did a bit of shopping! I selected a few random fat quarters that caught my eye, I particularly like the grey & red Margerite Daisy fabrics by Yuwa, they will be very useful. And that last lovely is a little piece of fabric from Naomi Ito, so very soft & light.